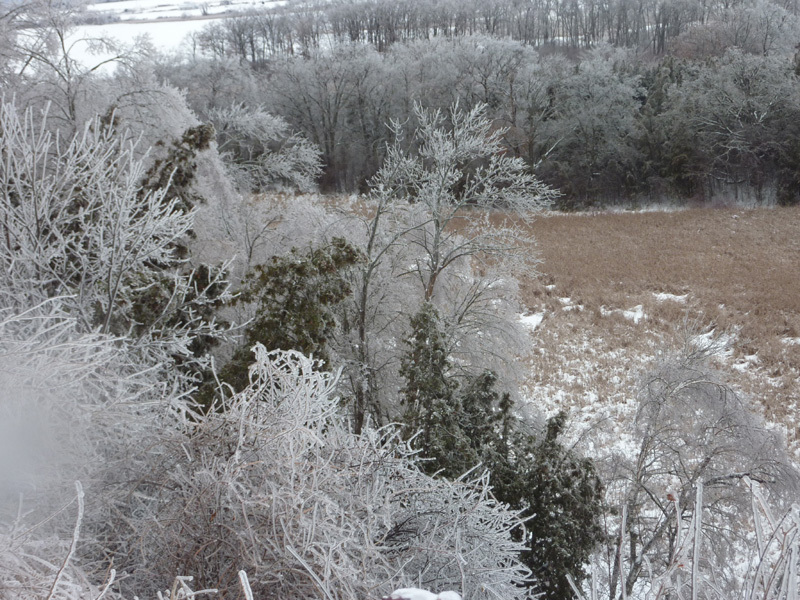 The December ice storm struck hard, making sure the ice stayed via a sharp temperature drop. Shrubs flattened under coatings of glass, small trees bent into glittering arches, the red cedar forests were frosted with ice, their whitened heads bent like crowds of refugees marching toward the horizon. The Chinese elm behind the house lost several large branches and will need extensive chain saw surgery. Hungry birds swarmed the feeders. Predators were hungry too, judging by the scatter of blood and dove feathers beside the deck. Ice covered woods that tinkled and crashed continually. Frozen snow, topped with just enough new snow for footing, provided the novelty of hiking for miles atop a perfectly smooth surface to inspect the beaver pond, the maple swamp, the buried pastures, the prickly ash thickets and coyote trails. The horned owl which came to a bad end on the barbed wire fence weeks ago had been stripped to the bone. Scarlet sumach heads and cattail reeds were preserved in crystal. Glazed stalks of grass and thistle broke off and skidded like transparent pucks away across the snow. Very Doctor Zhivago. Of course the power went out. No matter to me. I have a trusty wood stove and a big pile of firewood. And I can always take my bucket down to the ever running spring below the hill as people have done here for the past 200 years. If the sun peeps out, my passive solar panel, made of pop cans and plexiglass, pumps heat into the house for free. The outdoors can double as an immense refrigerator/freezer.